Sitka Log Homes of 100 Mile House, BC, was asked to be the feature display at the Vancouver Home Show. After the huge success of BC Canada Place in Torino, Italy for the 2006 Winter Olympics, the Greater Vancouver Home Builders Association asked that Sitka Log Homes Inc. provide the feature display at their Vancouver home show in February 2007 at BC Place. The 1200 sq ft log home including loft offered the show’s visitors the chance to see for themselves what all the fuss in Torino was about after more than 100,000 people visited Sitka’s log house during the Winter Olympics. The logs used for this handcrafted log home were of Pine that had been affected by the Mountain Pine Beetle presenting it with a unique blue tinge, and proving the structural integrity and the opportunity for putting this sound timber to good use. The display incorporated a variety of BC businesses and their products to complete the home including exterior finish, cabinets, furniture, artwork, lighting fixtures complete with high tech lighting controls. The exterior landscape included large live trees surrounded by flower gardens, stone and waterfall features and a complete outdoor kitchen. Paving stone paths and patio were designed to move the expected 70,000 people through the display. Sitka sold the completed log home in only a few hours after the show opened to one lucky attendee. The main floor is 832 sq.ft. and the loft is 423 sq.ft. for a total of 1,255 sq.ft. How many square feet is this house? The main floor is 832 sq.ft. and the loft is 423 sq.ft. for a total of 1,255 sq.ft. Is there a basement with this log house? There can be if you so choose for your design. The basement would add another 832 sq.ft. making the grand total 2,087 sq.ft. What is the cost per square foot? This home costs $158 per square foot as you see it. (February 2007) You would have to add in a foundation/sub-floor plus electrical and plumbing for a total cost. What kind of foundation is required for this log home? 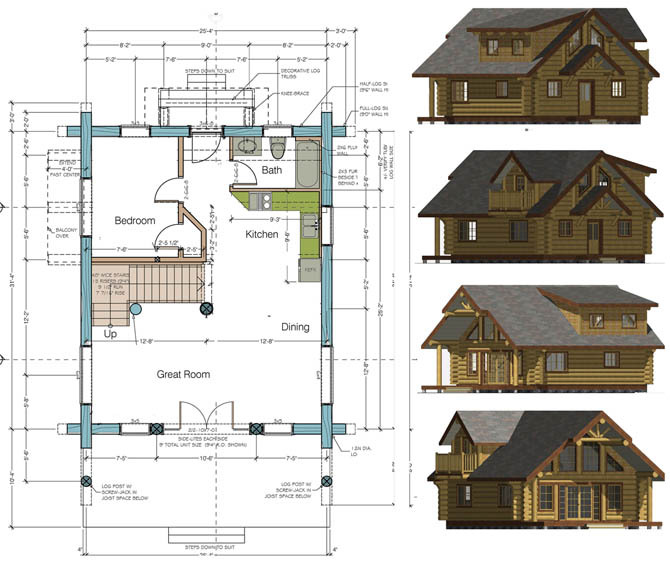 The foundation required for this log home is not different than conventional frame construction including the concrete walls which are regularly 8“ thick. The log work is placed directly on top of the framed sub-floor of the main floor. How much would a foundation and sub-floor cost? At this point (February 2007), we have had estimates of about $ 17,000 complete with drain rock, drain tile, forms and cement. This is assuming the foundation walls would be 8’ high for a full basement. You would also have to factor in electrical and plumbing to this cost as well. Can the floor plan be changed? Yes. The home is designed currently for this show, but the interior rooms can be changed to suit your needs. Where does the plumbing and wiring go? Most of the wiring is inserted throughout your main floor sub-floor, as is the plumbing. Any plumbing chases would go in interior framed walls on both levels. Electrical holes are drilled in locations already and any other plugs can be inserted where ever the client wants afterwards. What species of wood is used for this log home? The logs are Lodgepole Pine that were harvested from standing dead found in the mountain pine beetle devastated forests in the interior of BC. Where was the log home built? At Sitka Log Homes in 100 Mile House, then numbered, tagged, loaded onto trucks and shipped to Vancouver for re-assembly. How long did it take to build the log house? It took 8 weeks to construct the log work alone. To set the house up in BC Place took 8 days with most of the pre-fabrication completed prior to arrival here. How long does it take to set up a log building like this? The log work alone takes two days with a crew of 4-5 men. The rest of the house is dependant on how you finish the home. What is the roof made of? The roof is made of 12“ I-joists with pine T&G on the inside ceilings and plywood on the outside. It is all insulated and built as per building code standards. What are the windows made of?Western Red Cedar.